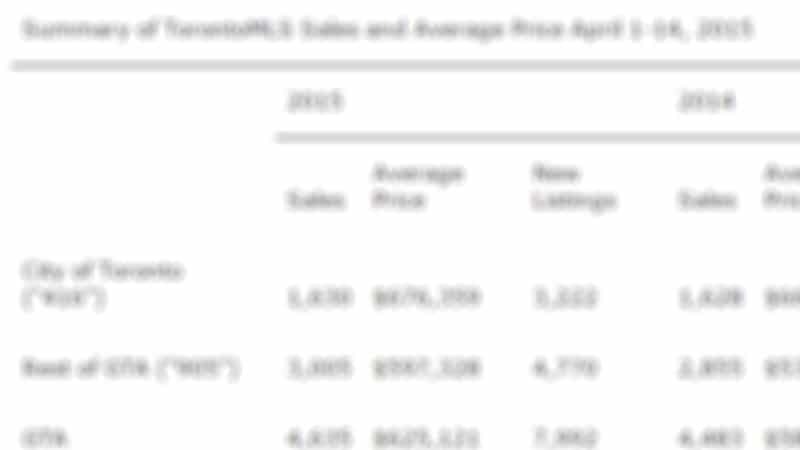 TORONTO, May 5, 2015 — Toronto Real Estate Board President Paul Etherington announced that Greater Toronto Area REALTORS® reported 11,303 sales in April 2015. This was the highest sales result on record for the month of April and represented a 17 per cent increase in comparison to April 2014. While sales increased strongly on a year-over-year basis, new listings were up over the same period by a more moderate five per cent. “The record April result clearly points to the fact that a growing number of GTA households view ownership housing as a high quality long-term investment. This is evidenced by the strong sales growth we have experienced in Toronto and surrounding regions for all major home types. First-time buyers and existing homeowners remain very active in today’s market,” said Mr. Etherington.